Vario Lama SA315B turbine rc helicopter-Jojo flying. Jojo flying the Vario Rc turbine helicopter at Ta Qali in Malta. Just another Tue afternoon. Gaui X5, stock motor, ESC, 8717’s @ 8v, Full Blueline Vbar 5.2pro, 8900g, belt tail, 550mm blades, Genace 4k 25c 6s. 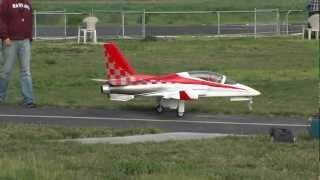 Viper RC turbine jet airplane flying at SCCMAS.